Komisyon sa Wikang Filipino (Commission of Filipino Language) posted this viral image on their educational FB page Wikapedia. Basically, it says that Alibata isn’t true. It was invented by a teacher who thought it came from the Arabs. Baybayin is the native alphabet of the country. The root is Baybay meaning spelling. It’s ours and not borrowed. 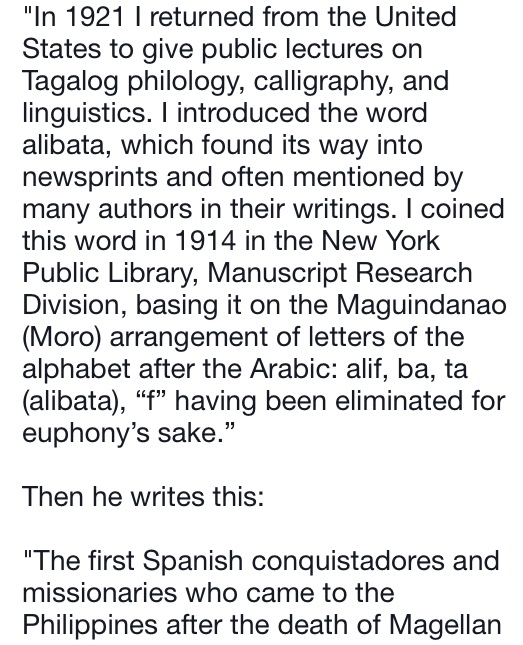 1) Hindi totoo ang Alibata (Alibata isn’t true) is a bit weird and misleading because it’s vague. What’s not true? Alibata the word or the writing? Why isn’t it true? 4) Hindi hiniram (not borrowed) is weird wording as well. Baybayin along with most of South East Asian scripts have roots in India. Is that considered borrowed? 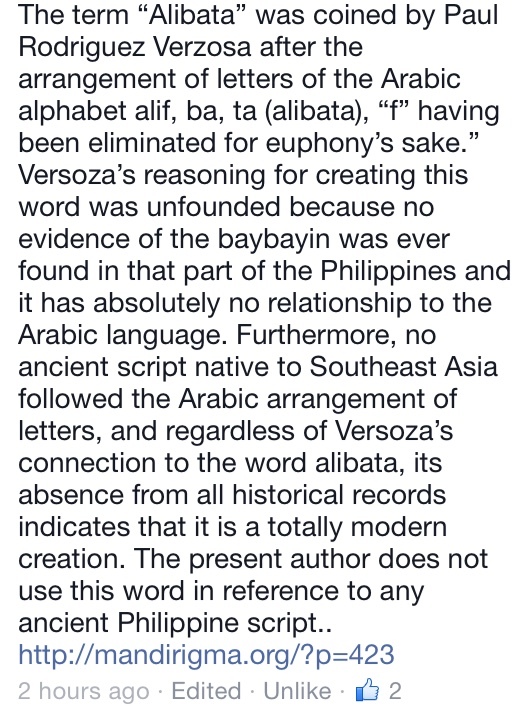 Are they insinuating that Baybayin was 100% created in the Philippines without any outside influence? Virgilio S. Almario, of KWF wrote a blog post with additional details (some incorrect) about why it’s not Alibata along with challenges in changing all the textbooks. What was interesting was that he also mentioned that mass media is also a reason why Alibata spread. The root of that is that they learned it in school through incorrect textbooks. At the end of the day, if it’s called Alibata, Baybayin or Super Pinoy Power Writing, they haven’t provided any value other than a sense of “cultural pride” to students who want to be lawyers, entertainers or call center agents. It unfortunately is all about economics. That’s the challenge for any endangered writing system/language in the so-called Philippines, Indonesia, Malayasia, etc. So what if DeafEd changes Alibata to Baybayin in textbooks? Will there be new surrounding content to give proper historical, cultural and modern context? What is their value proposition other than passing a test, writing the national anthem and feeling good about yourself for a couple days? 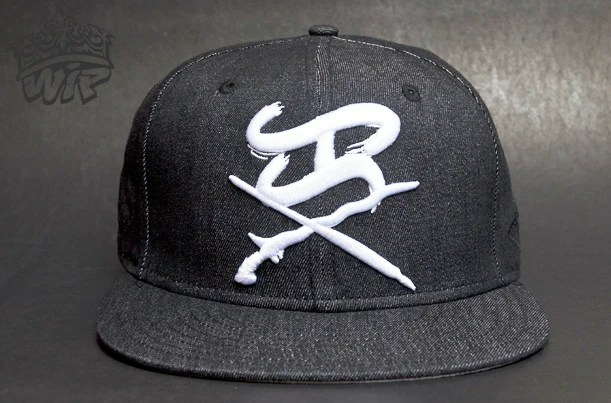 Rather than sensationalizing the ancientness of Baybayin and unproven stones, the government should be more focus on living scripts such Surat Mangyan, Kulitan, and save Surat Buhid and Tagbanwa from really becoming extinct. 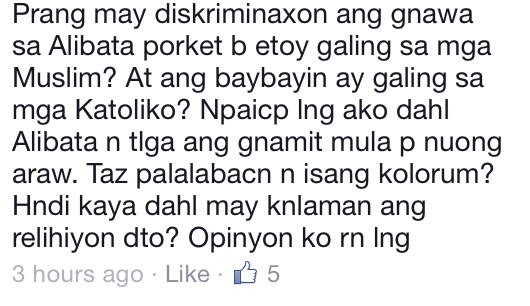 This entry was posted in Articles and tagged alibata, government, kwf, wika. Bookmark the permalink.